Aging is a dreadful yet undeniable truth of human existence. People as they grow-up, step up into maturity also grow old not only mentally but physically as well (This is the law of nature). The physical Symptoms are visible through wrinkles on the skin, Slow body stimulus and movements, White hair growth in Beard (particularly in men) and of course over the head as well. The white hair growth is a natural process concerned typically with increasing age, it can also occur due to a number of causes namely: Deficiency of Melanin, Hormonal imbalance, stress, Genetic disorders, chemical disorders etc. 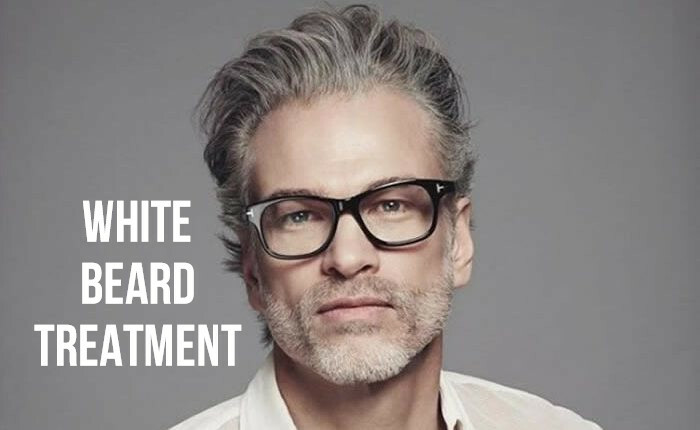 Specifically talking about men White Hair in Beard is something no one can avoid, you cannot control or delay the process as it is going to happen anyway, but thanks to the technological advancements of today White Hair Treatments are easily available which allows you to reverse the affect of aging on your beard. Before we move further onto White beard Treatments, we need to know why White Hair in Beard grow? Hair is originally white. It gets pigment, Melanin through specialized cells called melanocytes. These cells pump this pigment into the hair follicles that gives hair a characteristic color. Scientist believe that our hair follicles have a melanogenic clock that regulates hair pigmentation with age and hence minimizes it with aging. The only possible culprit of White Hair in Beard is increasing production of Hydrogen Peri-oxide. Gooseberry is a really famous fruit which treats almost every ailment in this world. If you want to fight obesity, stomach problems skin infection, white beard problems, etc. then you should definitely go for gooseberry. You would need to buy powdered gooseberries for treating white hair. Mix powdered gooseberry with lemon juice and apply it on your white beard. Massaging over the white beard with this mixture will make your beard black in few days. Do this on a daily basis for best results. Crush 8-10 curry leaves and add 1 tablespoon of coconut oil. Keep this mixture on a low flame for 5 minutes and then let it cool. Massage this mixture gently on your beard. Repeat process regularly for speedy results. 1. Take out the juice of curry leaves. Mix it along with one tablespoon of buttermilk. Let the mixture boil for 5 minutes on a low flame. When it cools down, massage your beard. Let the mixture dry for 30 minutes afterwards rinse with lukewarm water. 2. If you don’t have much time for such experiments, you can simply boil around 10 curry leaves and drink the water when it is lukewarm. Repeating this process daily would help you get desired results. Mixing gooseberry with coconut oil creates an effective treatment for your problem. Take a small aluminum boil and add 1 teaspoon of gooseberry powder. Take 1 tablespoon of oil and blend the two. Heat for 3 minutes and let it cool. Massage the mix on your beard for 5 minutes. Let it dry for the next 15 minutes and wash off with clean water. Take cow’s milk butter and rub it on the white beard regularly for 8-10 times a month for desired results. All these natural remedies for White Hair Treatment are effective only when performed regularly. If you feel any itchiness, irritation or burning sensation on the skin kindly consult your doctor immediately. With growing trend of modernization Craze Of Salons In Men has seen an abnormal rise over the previous decades. The percentage of men going to saloons for personal care has increased due to change in lifestyles. Read More : 5 Things Men Must Consider Seriously to Become Every Woman’s Favorite. Merely talking about White Beard Treatments men tend to take it as a set back to their personality as stepping into old age is not what everyone can take constructively. Men tend to panic and finally end up doing really harmful White Beard Treatments which results into total loss of melanin content in the hair follicles. Before going in for chemical White Hair Treatments what we need to really understand is that these methods are temporary and will go after several washes and soap uses. Given below is a step wish explanation as to how to dye the beard as a White Beard Treatment. While there are numerous brands trying to sell their products on the basis of fake promises you need to understand to use the dye which is ammonia free. Ammonia tends to burn the hair follicle which might result in permanent loss of beard growth. Your beard hair are completely different from your scalp hair. The beard hair tend to be more rougher, courser and drier compared to the scalp hair. Therefore extra attention needs to be paid on the beard hair. Always go for a darker Dye and apply it for a lesser time than recommended. If you fear you might end up doing something wrong it is always recommended to go to the expert beard saloons. They will help you choose the right dye and also apply the dye in the right manner which you might fail to do. If you fear going for a check White Beard Treatment i.e a chemical dye it is always advisable to go for products like Henna which are natural dyes and 100% skin safe. White Beard Treatments are also possible if we bring certain changes in our lifestyles life quitting smoking, going for walks, drinking non-aerated juices, eating tablets for boosting vitamin B12. Besides these you need to take care of your beard properly like washing them off from dust and pollution, applying beard oils etc. You cannot stop the ongoing biological process due to which your beard turns white but still going for the White Beard Treatments should be the last option in your mind, by adopting a healthy lifestyle at an early age you can delay your aging process.